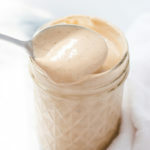 Homemade tahini salad dressing is so easy to make that you’ll never want to buy storebought dressing again! It’s lightly garlicky and lemon-y and perfectly creamy. What is a salad without a delicious salad dressing? I often buy Annie’s Goddess dressing from the store, (not to be confused with green goddess dressing! ), but when I have some forethought or a little extra time I love to make homemade goddess dressing. 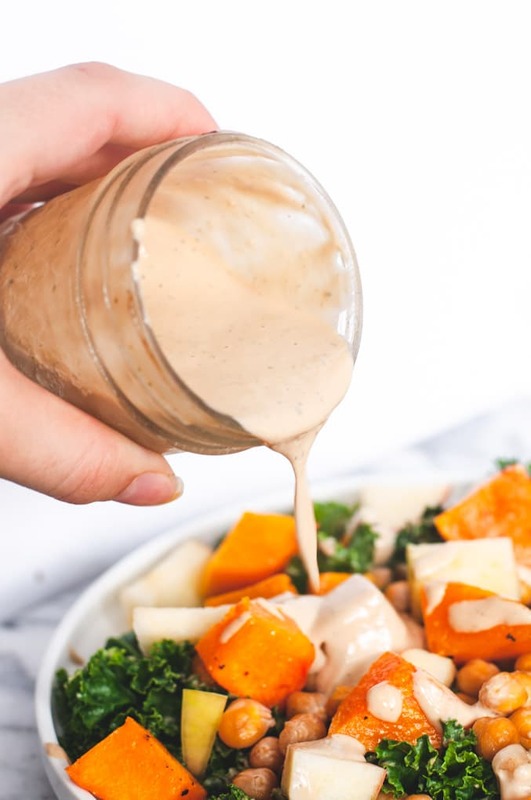 This recipe is my twist on the original Annie’s dressing, making it a goddess style tahini dressing, AKA the best kind of salad dressing! 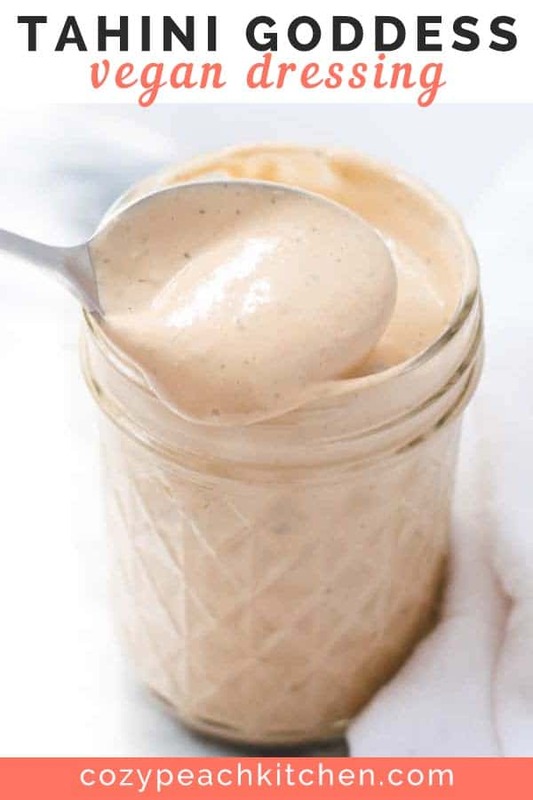 Tahini goddess dressing is a healthy salad dressing that’s free from added sugars. It’s lemon-y, lightly garlicky, and packed with flavor. 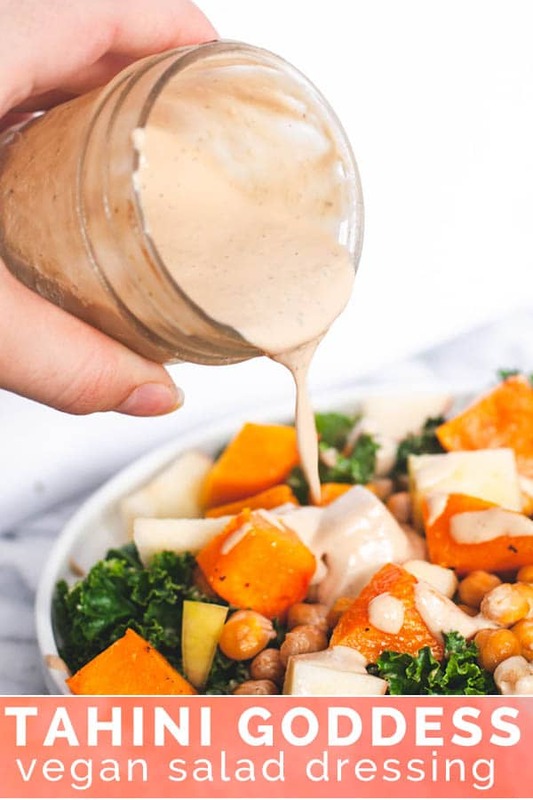 The creaminess in this vegan salad dressing comes from tahini, which is made from toasted sesame seeds. Yummm! Making homemade salad dressing is a great way to make your salads a little healthier. It’s seriously amazing how quick and easy it is to whip up a dressing! Just combine all of the ingredients in a blender and blend until smooth. You can add 1 tablespoon at a time of water for a thinner texture, or keep it as is. The dressing will thicken when it’s refrigerated; add a splash of water to thin before serving. Prefer a dressing that’s a little less garlicky? Great, cut down on the garlic cloves. 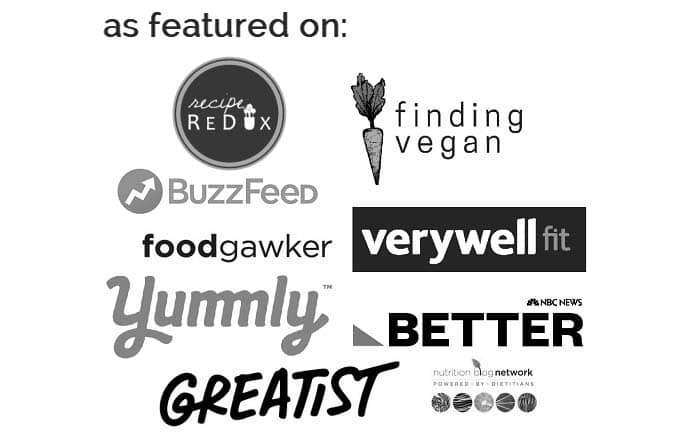 Looking for a little extra kick? Try a dash of hot sauce! This recipe makes 5-6 servings of tahini dressing. It lasts in the fridge for about a week, or you can make it in bulk and freeze in individual jars. Just place a jar to thaw in the fridge for 1-2 days prior to use. 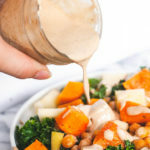 Try out this tahini goddess dressing on a warm kale salad with roasted butternut squash or this kale salad with chickpeas. 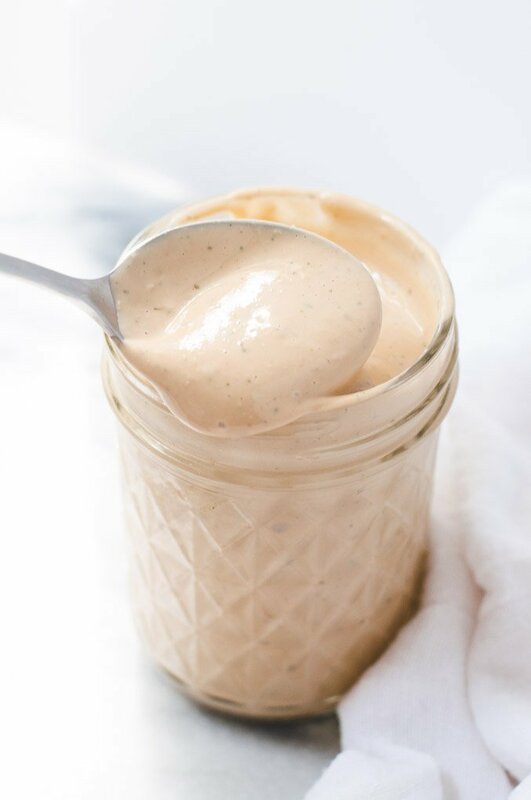 This easy vegan salad dressing is lemony, lightly garlicky, and perfectly creamy. Add all ingredients to a blender and blend until smooth. Add water 1 tablespoon at a time to thin to desired consistency. Store in airtight jar for up to a week.